In the most recent epic study on "pre-Big Bang science" Stephen M. Feeney and colleagues from the UK, Canada, and the US have revealed that they have discovered four statistically unlikely circular patterns in the cosmic microwave background (CMB). The researchers think that these marks could be “bruises” that our universe has incurred from being bumped four times by other universes. If they turn out to be correct, it would be the first evidence that universes other than ours do exist. The idea that there are many other universes out there is not new, as scientists have previously suggested that we live in a “multiverse” consisting of an infinite number of universes. The multiverse concept stems from the idea of eternal inflation, in which the inflationary period that our universe went through right after the Big Bang was just one of many inflationary periods that different parts of space were and are still undergoing. When one part of space undergoes one of these dramatic growth spurts, it balloons into its own universe with its own physical properties. As its name suggests, eternal inflation occurs an infinite number of times, creating an infinite number of universes, resulting in the multiverse. These infinite universes are sometimes called bubble universes even though they are irregular-shaped, not round. The bubble universes can move around and occasionally collide with other bubble universes. 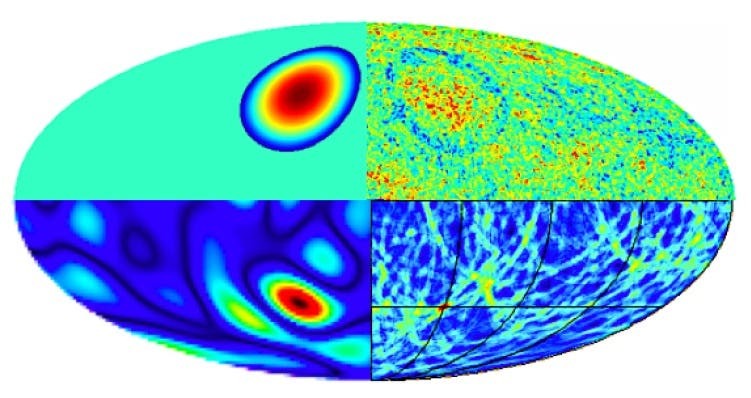 As Feeney, et al., explain in their paper, "these collisions produce inhomogeneities in the inner-bubble cosmology, which could appear in the CMB. The scientists developed an algorithm to search for bubble collisions in the CMB with specific properties, which led them to find the four circular patterns." The scientists acknowledge that it is rather easy to find a variety of statistically unlikely properties in a large dataset like the CMB. The researchers emphasize that more work is needed to confirm this claim, which could come in short time from the Planck satellite, which has a resolution three times better than that of WMAP (where the current data comes from), as well as an order of magnitude greater sensitivity. Nevertheless, they hope that the search for bubble collisions could provide some insight into the history of our universe, whether or not the collisions turn out to be real. “The conclusive non-detection of a bubble collision can be used to place stringent limits on theories giving rise to eternal inflation; however, if a bubble collision is verified by future data, then we will gain an insight not only into our own universe but a multiverse beyond,” the researchers write in their study. This is the second study in the past month that has used CMB data to search for what could have occurred before the Big Bang. In the first study, Roger Penrose and Vahe Gurzadyan found concentric circles with lower-than-average temperature variation in the CMB, which could be evidence for a cyclic cosmology in which Big Bangs occur over and over.